Robert Faherty of Braintree, Mass. wins second prize of $10,000 for Cops for Kids with Cancer. 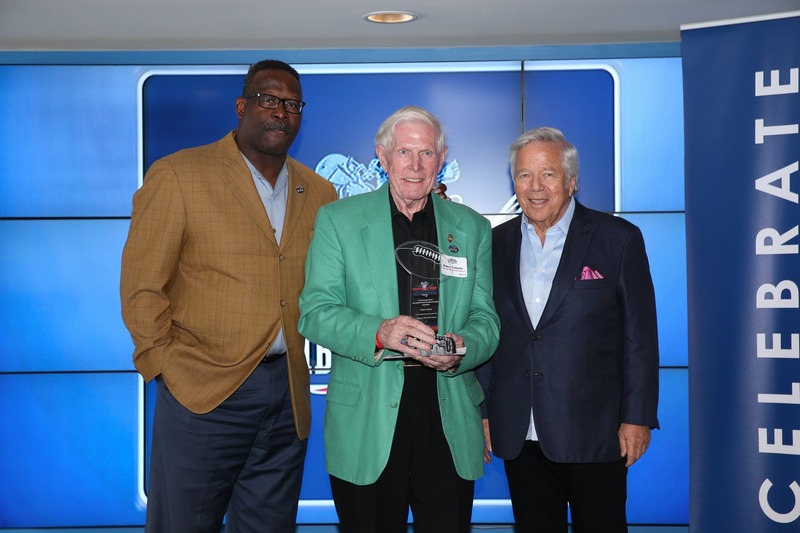 On hand to congratulate the award winners were Patriots Chairman and CEO Robert Kraft, New England Patriots Charitable Foundation President Joshua Kraft and Patriots and Pro Football Hall of Famer and Patriots Executive Director of Community Affairs Andre Tippett. Patriots players Tom Brady, Julian Edelman and Rob Gronkowski also made a surprise appearance to congratulate the winners. Robert Faherty of Braintree, Mass. was selected as one of this year’s $10,000 second prize winners. After a career in public service, Faherty retired from the Boston Police Department as the Superintendent in Chief in 2001. Shortly thereafter, he became involved with a nonprofit organization – Cops for Kids with Cancer – that was started by one of his long-time friends who was also battling cancer. Following the passing of his friend in 2005, Faherty took over as the CEO of the organization. Over the years, he has helped to raise more than two million dollars to help families cover their living expenses as they underwent treatment. Thanks to Faherty’s leadership, the organization has grown tremendously and they have managed to positively impact more than 500 families battling cancer. The 2017 Myra Kraft Community MVP winners range from 17 to 86 years old and represent every New England state. Winning nonprofits provide support for many causes, including education, domestic violence prevention, healthcare, homelessness, mentoring and military support. The Kraft family and New England Patriots Charitable Foundation received hundreds of applications this year from nonprofit organizations looking to recognize their outstanding volunteers. Nominations open each spring and the awards are open to all nonprofit organizations in the New England region. 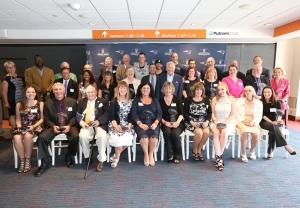 For more information on the Myra Kraft Community MVP Awards, please visit www.patriots.com/community. Fabienne Eliacin Dorchester, Mass. Dudley Street Neighborhood Initiative Roxbury, Mass. Justin Doo Walpole, Mass. Moyamoya Disease Research Walpole, Mass. Robert Faherty Braintree, Mass. Cops for Kids with Cancer Braintree, Mass. Jerry Ferrera Framingham, Mass. St. Francis House Boston, Mass. Cherylann & Len Gengel Worcester, Mass. The Be Like Brit Foundation Worcester, Mass. Judy Giovangelo West Roxbury, Mass. Ben Speaks Louder Than Words Holliston, Mass. Tim Grover Lowell, Mass. The Megan House Foundation Lowell, Mass. Ryan Matthews Plainville, Conn. The Susie Foundation Beacon Falls, Conn.
Barbara Smith Acton, Mass. Household Goods Acton, Mass. Janet Ulwick-Sacca Gloucester, Mass. National Braille Press Foundation Boston, Mass. Lori Bateman & Kylee McCumber Leominster, Mass. Kylee’s Kare Kitz for Kidz Leominster, Mass. Maggie Bornstein Amesbury, Mass. Lucy’s Love Bus Boston, Mass. Steve Brosnihan Bristol, R.I. Rhode Island Hospital Providence, R.I.
Stephen Colella Warwick, R.I. Job Club Rhode Island Warwick, R.I.
Frances Davis Watertown, Mass. Windrush Farm North Andover, Mass. Nicole DiPaolo Randolph, Mass. Paws4Survival Rescue Randolph, Mass. Louise Griffin Hampton, N.H. Zack’s Team Foundation Billerica, Mass. Debbie Mearls Brockton, Mass. Soldier’s Angels Brockton, Mass. Jana Planka Narragansett, R.I. Rhode Island Mentoring Warwick, R.I.
Neil Rhein Mansfield, Mass. Keep Massachusetts Beautiful Mansfield, Mass. Kenneth Thompson Rutland, Vt. Vermont Elks Charities Rutland, Vt.
Laurie Tomaszewski Nashua, N.H. Lil’ Iguana’s Children’s Safety Foundation Nashua, N.H.
Kathy Wood Canton, Conn. Friends of Canton Football Canton, Conn.
Jack Zorski East Falmouth, Mass. Falmouth Volunteers in Public Schools Falmouth, Mass.